DGAP-News: Metallic Minerals Corp. / Key word(s): Miscellaneous Metallic Minerals Announces Surface Samples up to 12,000 g/t Silver from Keno Summit Targets on Keno Silver Project in the Yukon Territory 04.12.2017 / 16:00 The issuer is solely responsible for the content of this announcement. Vancouver, British Columbia--(Newsfile Corp. - December 4, 2017) - Metallic Minerals Corp. (TSXV: MMG) (OTC Pink: MMNGF) ('Metallic Minerals' or the 'Company') is pleased to announce initial exploration results from its 2017 field program, including trenching and surface sampling at the Keno Summit area of its 100% owned Keno Silver Project, in Canada's Yukon Territory. 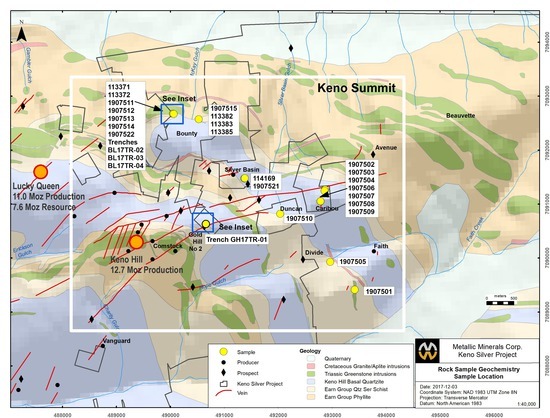 The Keno Silver Project is located in the historic Keno Hill Silver District; a region which has produced over 200 million ounces of silver and currently hosts one of the world's highest-grade silver resources. Further data analysis on the project is in process and additional results from the 2017 program, which included diamond core drilling at the Caribou/Duncan and Homestake targets, are anticipated in the coming weeks. During Metallic Minerals' inaugural program at the Keno Silver Project, the Company conducted field investigations, including detailed stratigraphic mapping of trenches and outcrops, surface sampling, satellite photogrammetry, geophysical surveys, soil sampling, trenching and diamond drilling. Twelve targets were prioritized for initial follow-up work, with three of these advanced to the drill targeting stage which commenced in September. Trenching was completed on five target areas which had identified prospective areas through soil sampling and geophysics. The trenching was intended to confirm the presence of significant bedrock mineralization that could be advanced to drill-ready status and was conducted primarily in the Keno Summit area, namely at Gold Hill, Bounty, Caribou, Faith/Divide and Homestake targets (see Figure 1). A total of approximately 0.5 kilometers of trenching was completed in 18 locations as a series of linear trenches or pits. The trenches yielded valuable stratigraphic information, with particularly noteworthy results returned from the Gold Hill and Bounty target areas where significant new bedrock mineralization was exposed at surface following initial soil and rock sampling. 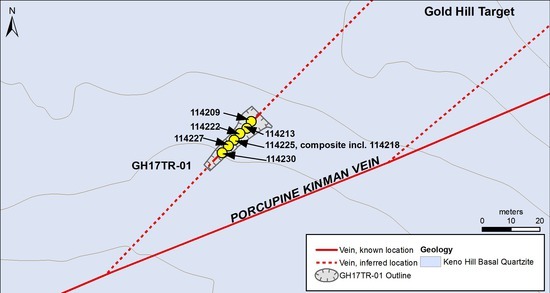 The Gold Hill trench discovery, with grades up to 5,747 g/t silver equivalent (AgEq), is interpreted as a splay off the main Porcupine/Kinman structure which yielded 22,863 tons of historic production from the Comstock Mine, with average production grade of 1,240 g/t silver. The Gold Hill vein structures are thought to be transverse-type veins similar to the style along the Porcupine/Kinman vein structure. Transverse-style veins in the district, like this new vein discovery, are typically very high-grade silver and can support significant ore-shoots. The Gold Hill trench was planned to follow up work conducted earlier in the season that identified a Pb-Zn soil anomaly. Upon intersecting the vein with trenching over approximately 8m, the trench was redirected to follow along the trace of the vein resulting in more than 20m of continuous exposure. The Bounty target covers the northwest part of the Keno Summit area where a series of northeast trending structures are hosted in the Keno Hill quartzite and greenstones. Historic work has been conducted on the Buccaneer and Rum Tum vein structures, where some limited prospecting exposed the veins. In August 2017, sampling was undertaken by the Company as an initial investigation of the area as a potential target. Results of up to 12,078 g/t silver were obtained from surface sampling at the Buccaneer vein structure. Further grab samples from the Buccaneer vein showed high levels of silver, lead and zinc with elevated gold and copper. These initial results were followed up with prospect scale mapping and trenching across the overburden covering the Buccaneer vein trend. Combined, the four trenches uncovered 70m of strike extent straddling the historic area of workings. 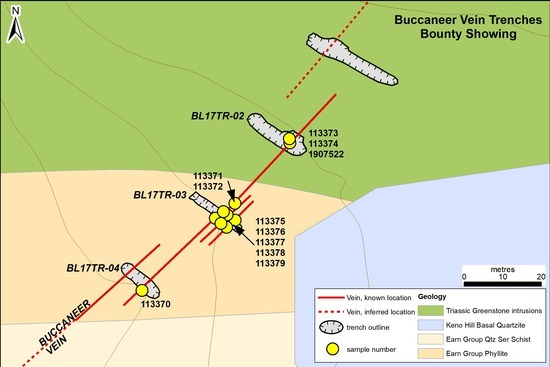 Based on these results, further work is warranted in 2018 and is likely to consist of additional trenching and drill testing of the Buccaneer vein. Encouraging results were also received on the Rum Tum vein structure. Soil sampling was conducted on the prioritized areas to test targets developed from known vein extensions, magnetic lineament studies and the extension of known anomalies from previous soil surveys. Soil samples were collected on eight targets including Silver Queen, Homestake, Bounty, Caribou, Faith, Vanguard, Duncan Creek and Vancouver. The surveys outlined significant anomalies in most of the target areas. These results have confirmed the value of soil sampling for developing new trenching and follow-up diamond drill targets at the Company's Keno Silver Project. Additional follow-up in these areas is planned for 2018. Detailed satellite ortho-photos were also collected over the entire property during the year. One-metre contour data produced from the imagery will enhance the project survey control. Ground and airborne geophysical surveys were conducted along 129 line kilometres in the Homestake, Silver Queen and Caribou/Faith areas. Further geophysical work will be conducted in 2018 as part of additional work on the identified earlier-stage targets. Metallic Minerals Corp. is a growth stage exploration company focused on the acquisition and development of high-grade silver and gold in the Yukon within under explored districts with potential to produce top-tier assets. Our objective is to create value through a disciplined, systematic approach to exploration, reducing investment risk and maximizing probability of long-term success. Our core Keno Silver Project is located in the historic Keno Hill Silver District of Canada's Yukon Territory, a region which has produced over 200 million ounces of silver and currently hosts one of the world's highest-grade silver resources. The Company's McKay Hill Project, northeast of Keno Hill, is a high-grade historic silver-gold producer. Metallic Minerals is also building a portfolio of gold royalties in the historic Klondike Gold District. Metallic Minerals is led by a team with a track record of discovery and exploration success, including large scale development, permitting and project financing. Analytical work in 2017 was done by Bureau Veritas Commodities Canada Ltd. with sample preparation in Whitehorse, Yukon and geochemical analysis in Vancouver, British Columbia. Each rock (grab) sample was analyzed for 36 elements using an Aqua Regia digestion with inductively coupled plasma-atomic emission spectroscopy (ICP-AES) and inductively coupled Plasma-mass spectrometry (ICP-MS) (AQ202). Samples with over limit silver and gold were re-analyzed using a 30-gram fire assay fusion with a gravimetric finish (FA530-Ag, Au). Over-limit lead and zinc samples were analyzed by multi-acid digestion and atomic absorption spectrometry (MA404) or titration (GC516, GC8917). All results have passed the QAQC screening by the lab. Scott Petsel, P.Geo, Vice President, Exploration, is a Qualified Person as defined by National Instrument 43-101. Mr. Petsel has reviewed the scientific and technical information in this news release and approves the disclosure contained herein. Mr. Petsel has reviewed the results of the sampling programs and confirmed that all procedures, protocols and methodologies used conform to industry standards. Forward Looking Statements: This news release includes certain statements that may be deemed 'forward-looking statements'. All statements in this release, other than statements of historical facts including, without limitation, statements regarding potential mineralization, historic production, estimation of mineral resources, the realization of mineral resource estimates, interpretation of prior exploration and potential exploration results, the timing and success of exploration activities generally, the timing and results of future resource estimates, permitting time lines, metal prices and currency exchange rates, availability of capital, government regulation of exploration operations, environmental risks, reclamation, title, and future plans and objectives of the company are forward-looking statements that involve various risks and uncertainties. Although Metallic Minerals believes the expectations expressed in such forward-looking statements are based on reasonable assumptions, such statements are not guarantees of future performance and actual results or developments may differ materially from those in the forward-looking statements. Forward-looking statements are based on a number of material factors and assumptions. Factors that could cause actual results to differ materially from those in forward-looking statements include failure to obtain necessary approvals, unsuccessful exploration results, changes in project parameters as plans continue to be refined, results of future resource estimates, future metal prices, availability of capital and financing on acceptable terms, general economic, market or business conditions, risks associated with regulatory changes, defects in title, availability of personnel, materials and equipment on a timely basis, accidents or equipment breakdowns, uninsured risks, delays in receiving government approvals, unanticipated environmental impacts on operations and costs to remedy same, and other exploration or other risks detailed herein and from time to time in the filings made by the companies with securities regulators. Readers are cautioned that mineral resources that are not mineral reserves do not have demonstrated economic viability. Mineral exploration and development of mines is an inherently risky business. Accordingly, the actual events may differ materially from those projected in the forward-looking statements. For more information on Metallic Minerals and the risks and challenges of their businesses, investors should review their annual filings that are available at www.sedar.com.